You have heard me gush about the talents of both Emily McCarthy and Lee Cox more than once on the blog. I adore both of them as business owners and precious friends. 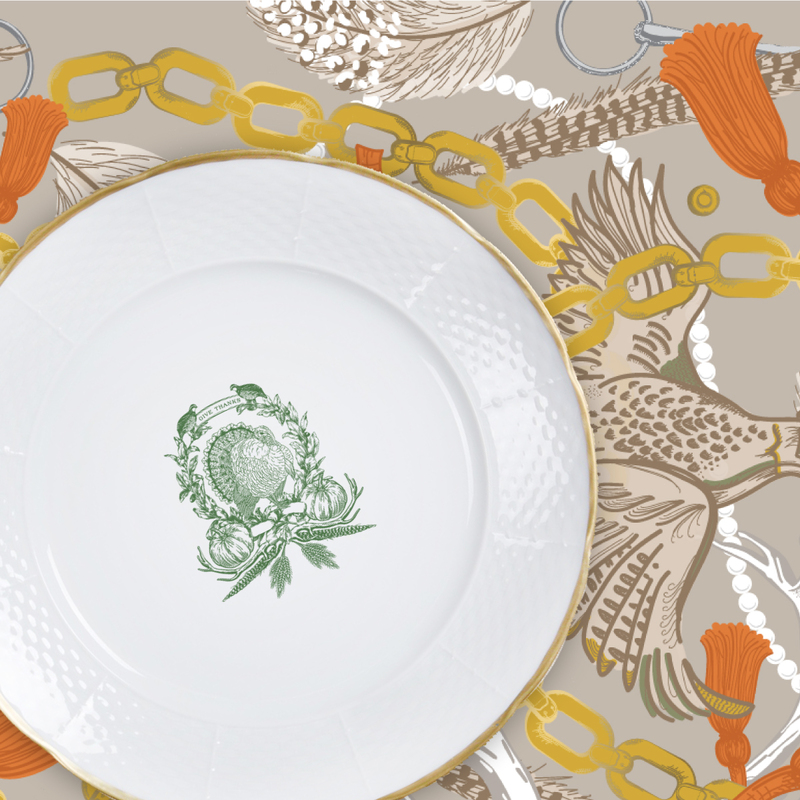 They have come together to create an exclusive limited edition tablescape collaboration, which is soon to be THE "new tradition for your table". 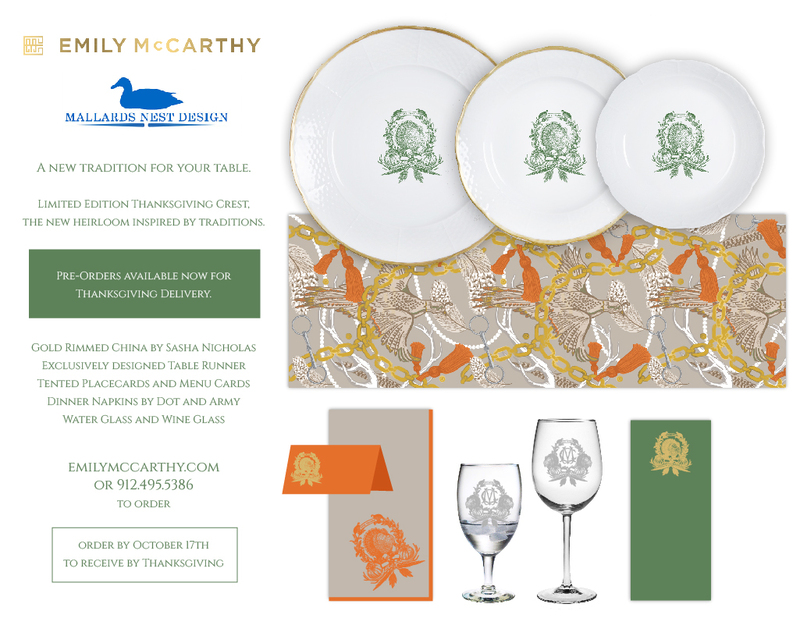 Their collaboration combines incredible china, glassware, essentials, and table linens with a fabulous Thanksgiving crest that can be personalized with your monogram. Think of it as timeless, custom pieces to be used during the fall, and with the addition of a monogram, all year long. I only have sneak peek of the collection at this time, but the sneaks alone will draw you right in! I truly can not imagine a better collaboration of all things table + entertaining. Emily is the leader in the design of custom pieces and this crest is a perfect combination of her incredible and boundless talent and Lee's love of all things classic design, tradition, paired with quality products. The leaves and greenery in the crest combines the low country where Emily lives and the red hill region where Lee resides. The bob white quail was a must have for the crest as it is the top economic producer for hunting in Thomasville. The connection for Emily + Lee goes so much deeper than just friendship and business as they both have such a love of traditional transitions of the seasons with a modern twist. The fabric for the table linens show one these modern twists with the addition of gold chain. I was excited to hear from Lee what this collaboration meant to him. I only had two questions since I knew exactly what I wanted to ask him. What inspired this collection for you? Tell me how your life and history in Thomasville, Georgia transitioned into the design. My grandparents and their love for tradition and entertaining inspired me to create this collection with Emily. 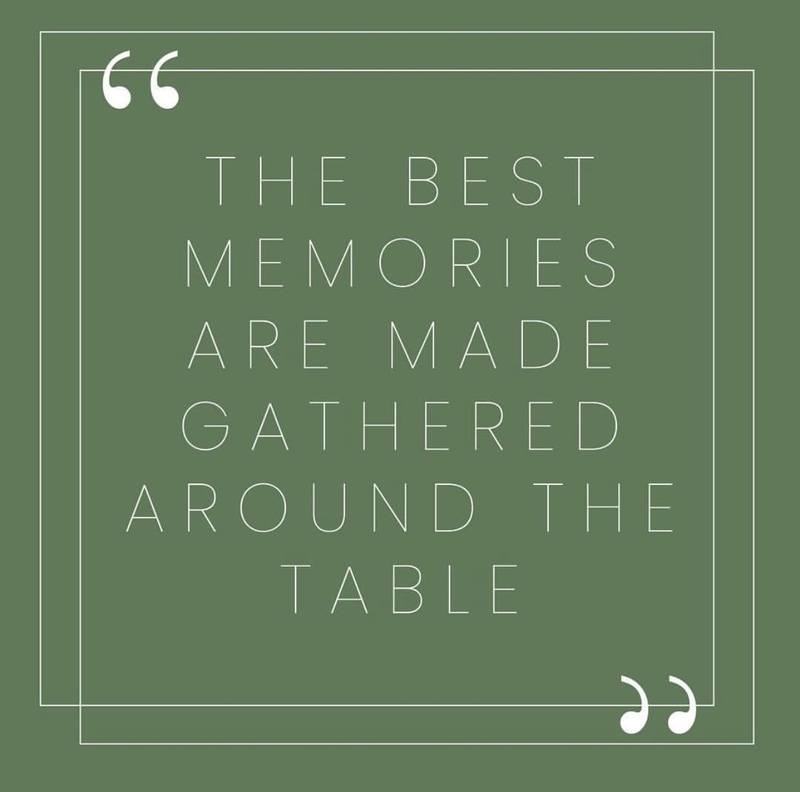 Through their entertaining and appreciation for aesthetic pleasure, my maternal grandparents taught me the joy of always welcoming friends an family into my home. I wanted to create a unique and bold china that inspires others to create traditions of their own. Thomasville, Georgia embodies a perfect combination of the quintessential small town community +high value of the traditional hunt in the all in the pursuit of the 3 oz bird. 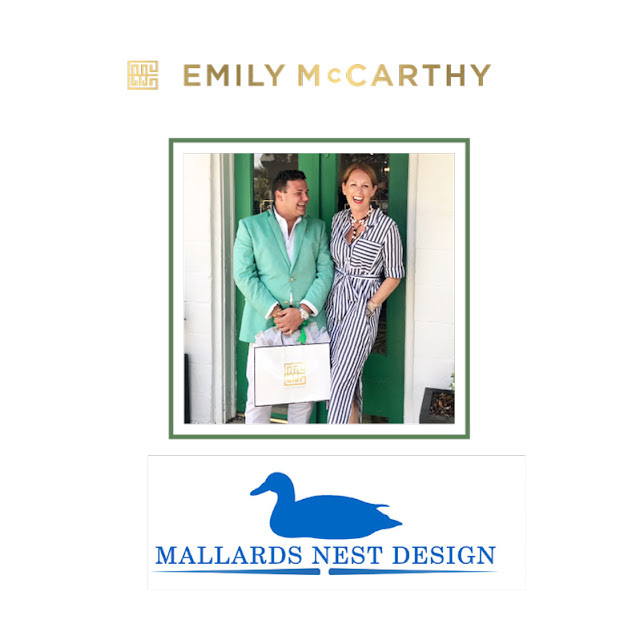 Why Emily McCarthy for this project, what about her work and her brand made this a perfect collaboration for you. Emily is a true artist. If I was a graphic designer I would want the style of Emily McCarthy .. posh and timeless, manipulated with bold and bright colors. I aspire to create similar interiors with traditional bones but contemporary accessories and elements. You can pre-order the collection here. You can also see it in person at one of the stops on Lee's Trunk Show Tour. 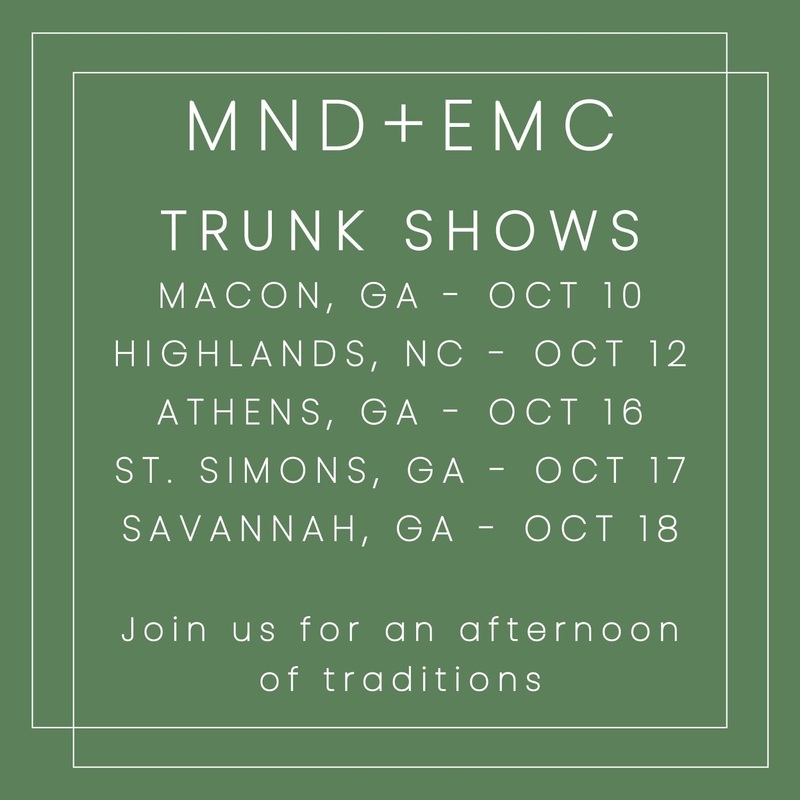 The tour starts on October 10th in Macon, Georgia and ends on the 18th in Savannah. You can most definitely find me there. I can't wait to squeeze both of them and celebrate this excitement with my precious friends. I love seeing those I care about grow and try new things. I have no doubt at all this collection will be loved and treasured by so many!